We at the Pompano Beach Club installed a water sensor system. We are a 29 story building and have had our share of water problems. In the past, a water leak could go on for hours before someone called. Now we know in minutes! As you might imagine our clean up costs and the resulting damage has been greatly reduced. I would recommend anyone in a high rise building call WaterLarm at 954-666-6222 and purchase the new water leak detection system. Seriously consider this option. It will save you money! I am available if you would like to discuss this valuable option. Building Manager, Pompano Beach Club North Association, Inc.
You were correct. Your water alarm system functioned seamlessly as promised. The leak detector system has prevented several flood and leak events since installed. I thought you should know how happy we are with your system and your service. Your leak detector technology is state of the art! Your system has paid for itself and our BOD is very happy with their decision to design and install the early warning leak detector system. 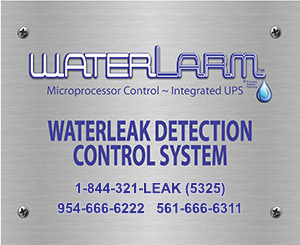 The microprocessor and water leak sensors provide immediate detection and are accurate as to the location of the leak. Tell other facility managers to call me for a reference any time. Some four years ago, WaterLarm installed water sensors in every utility closet for our 237 units. These closets house A/C units and hot water heaters. These water alarms are monitored by our Fire/Security system to detect a leak. We were very happy with the installation and remain completely satisfied with the operation of these water alarm sensors. They have proven to be extremely useful to detect a leak and preventing major damage due to leakage. I would like to take this time to tell you how happy the Savoy East is with our new Water Alarm system. With the newly installed water leak detector we now have potential safety devices against water damage. We’ve installed these water sensors in our AC units and hot water heaters throughout our building. We were happy that Michael suggested this system to us. We were also happy with the workmanship that was provided by your employees. The support of your field management and team far exceeded our expectations. Just a note to let you know that the water sensors we installed are functioning adequately and have been quite the damage saving feature that was promised. At first, I was skeptical as to their ability to be an early warning system to leak detection in our building. I must say, I have come to count on them each and every time they go off. If we have a water sensor activate, we have a leak or water from someplace, always. I have found hot water heaters, air conditioners, leaking pipes, washing machines and dish washers leaking. The cost savings from early detection of leaks has been enormous in this 43 year old building. In 2006, WaterLarm installed the fire alarm, security and water alarm system for the Shore Club Condominium in Fort Lauderdale Florida. The water alarm system has been a tremendous help to us. It has prevented several disasters on the property by alerting us to water leaks before they spread to other apartments. In my opinion, the water alarm system is worth the money. In summary, I highly recommend a water alarm system for any building. Also, I highly recommend WaterLarm for any endeavor that they may seek to pursue. I wanted you to know how much we appreciate the “water bug” feature of your alarm system. The water sensor, which is located in the air conditioning & water heater closets of all of our units, alerts our security officer anytime it detects water. This gives us the ability to investigate water leaks in a very timely manner. This small device has averted many problems over the past years, saving the association and unit owners from costly water damage repairs. I can highly recommend this water sensor device. Anyone upgrading their fire alarm system should strongly consider incorporating these into their alarm configuration. In fact, I was so impressed with the effectiveness of these leakage detection units, I’ve added a water sensor to my personal, independent fire/burglar alarm system at home (I live in another building). Please don’t hesitate to contact me should you have any further questions. I just wanted to thank you again about the water alarm system that WaterLarm installed here at Point of Americas I. Since your installation in 2007, the water leak detector has alerted us to an untold number of leaks. Your water alarm allowed us to detect these leaks before we experienced major damage. I believe that all high rise condominiums should install water alarm systems such as the one that we have here at POA 1.